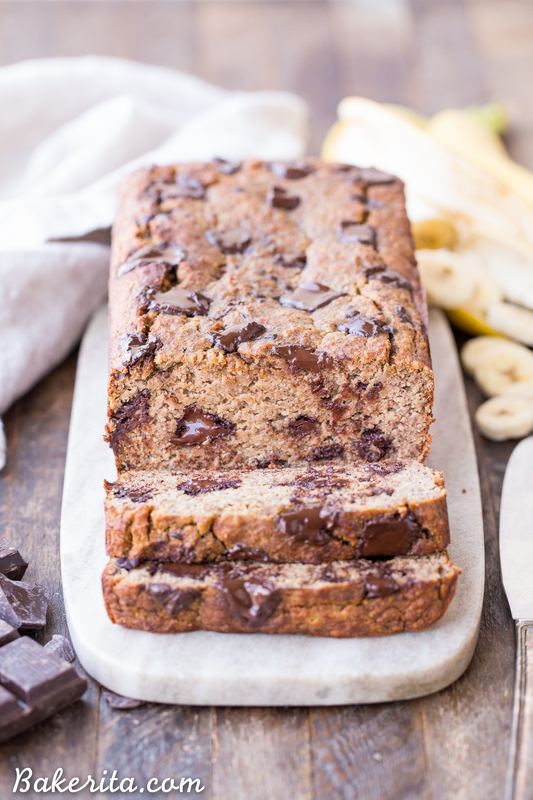 This Paleo Chocolate Chunk Banana Bread is sweetened only with bananas for a guiltless treat that tastes just like traditional banana bread! This is an easy recipe you’ll come back to again and again. This paleo banana bread is also gluten-free, grain free, and sugar-free. **2017 Update** This recipe has been a favorite since it’s initial publishing in August of 2014 – I’ve made it SO many times, always to rave reviews, and I know so many of you love it too! This well-loved recipe deserved some new photos, so it got a makeover! Of course, the recipe remains the same as when it was originally published, as does the original post text below. If you haven’t tried this one yet…what are you waiting for?! But…after I made it, and it got devoured within mere hours, with everyone having no idea it was grain-free and no sugar added (besides the chocolate), I decided it needed to be posted. And YEAH, you read that right – this banana bread has NO sugar added. Because THIS banana bread is sweetened only with bananas. Of course, I ruined the sugar free thing by adding chunks of chopped chocolate (so much better than chocolate chips guys – try it), but who can resist big melted chocolate chunks in their banana bread?!? Leave the chocolate out though (or make your own batch of paleo chocolate), and this stuff is totally paleo-friendly, grain-free, gluten-free, no sugar added, soy-free…I can’t think of any more “frees” but I’m sure it totally could apply to more diet categories too. I was eating slivers of this banana bread with some of the chocolate coconut almond butter that I used in the recipe as well. It was so beyond good, guys. The banana flavor comes through better than most recipes I’ve made, and they also add so much moisture and keep the bread super tender. The touch of cinnamon adds that extra bit of warmth too. SO good. I absolutely love how guilt-free this stuff is while tasting so insanely decadent. AND – it’s easy. I hate when quick batters take forever to come together, so it makes me happy that this one doesn’t take more than a few minutes of measuring and stirring ingredients together. No need to worry about overmixing either, since there’s no gluten in this recipe! 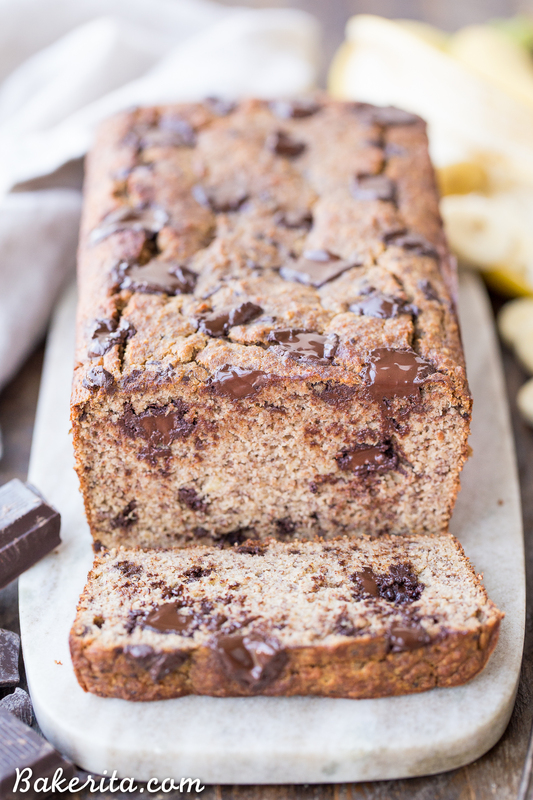 This Paleo Chocolate Chunk Banana Bread is a standout, even among all my other banana bread recipes. Since I posted this recipe back during my senior year of college, it’s been made countless times in my kitchen, in my sister’s kitchen, and in hundreds (maybe thousands?) of your kitchens! Tons of you have let me know that it’s a staple for you and your familys. I believe my favorite way to enjoy a slice is warmed up for about 15-20 seconds in the microwave, either plain or with a tiny bit of almond butter drizzled on top…swooooon! If you’re one of the folks that haven’t yet tried this Paleo Banana Bread, I think it’s time to change that! You’re going to love this moist, flavorful, just-sweet-enough banana bread. Get the recipe below, get to baking, and enjoy each and every bite. 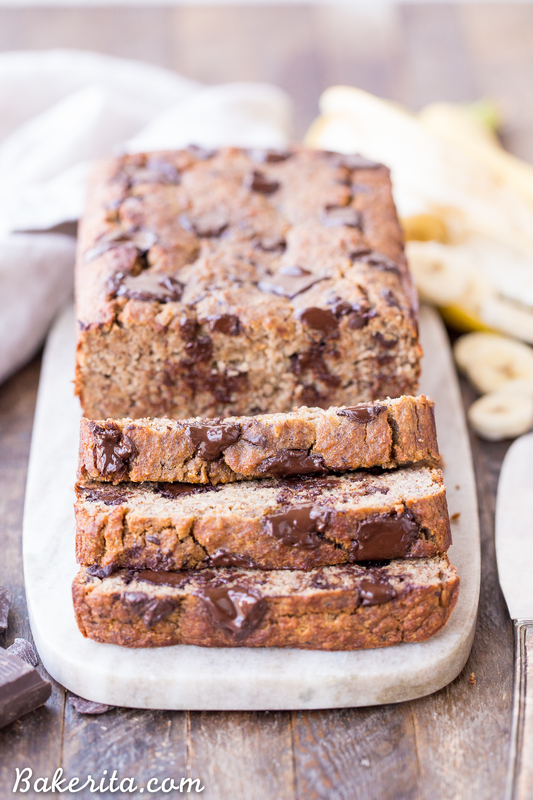 This Paleo Chocolate Chunk Banana Bread is sweetened only with bananas for a guiltless treat that tastes just like traditional banana bread! This is easy recipe you'll come back to again and again. This paleo banana bread is also gluten-free, grain free, and sugar-free. Grease one 9"x5" loaf pan (or 8"x8" square pan, which is what I used) and preheat the oven to 350ºF. Bake in the preheated oven for about 40 minutes if using a square pan, and 50-60 if using a loaf pan. A toothpick inserted into the center should come out clean, and when you press down lightly on the loaf, it should spring back, not stay indented. If a toothpick comes out clean but the loaf isn't springing back, keep it in the oven until it does to ensure it's baked through. Remove from oven and allow to cool on a wire rack for about 1/2 hour. Flip out onto a cooling rack to finish cooling. Try making your own Paleo chocolate chunks to use in this bread, which keeps it totally Paleo! 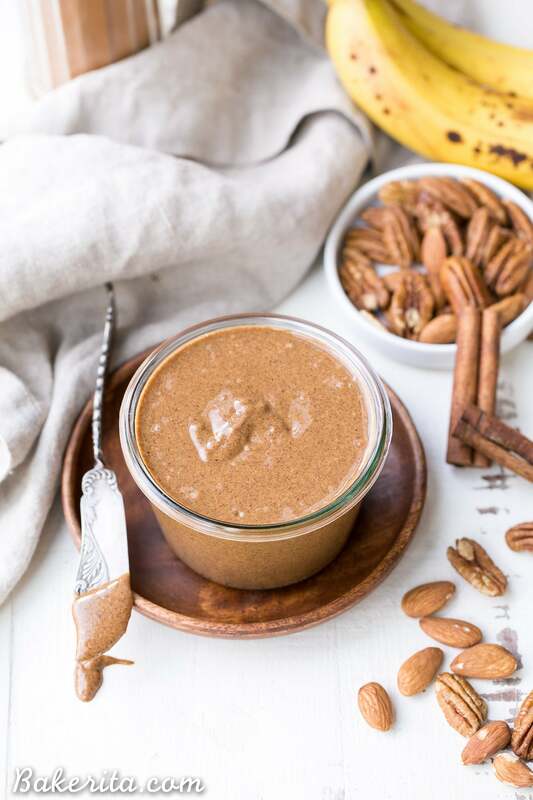 And it’s not quite banana bread…but I think you’ll love this Banana Bread Pecan Almond Butter! How many carbs are in one piece of banana bread? Hi Betty, you can insert the recipe link here: myfitnesspal.com/recipe_parser to calculate the nutritional information. I agree – I love using chopped chocolate instead of chips! It’s so good! And this bread looks fantastic … I wish I had a piece for dessert! SO glad you shared this recipe-looks totally gooey and incredibly tasty, and I cannot get over that it’s (mostly) sugar and grain free! Wow, I am in love with this bread! Banana bread is my absolute favorite, but making it paleo and with chocolate is the ultimate treat! Pinned! 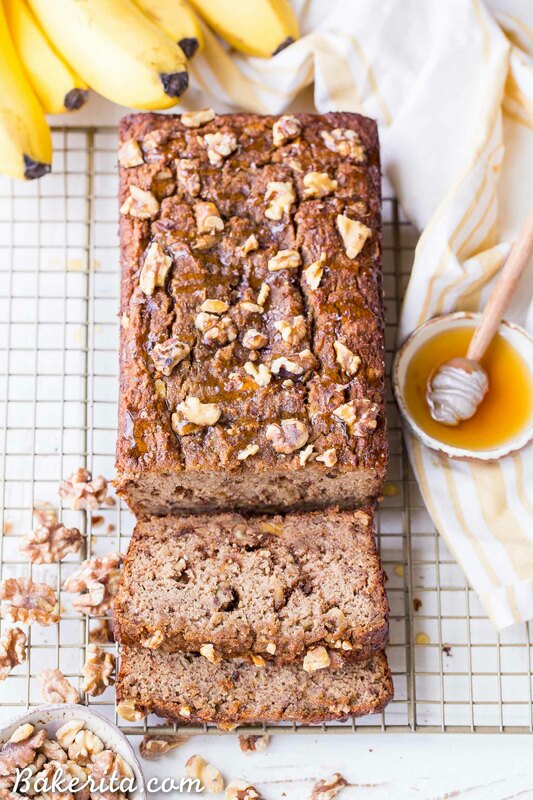 This looks beyond delicious and banana bread is my favorite morning treat! I think the pictures look awesome girl :) Definitely has me craving for some banana bread right now! Love the chocolate chunks in here! Oooh that looks great! Might need to fit that into my paleo diet this week! Thank you for posting this, and not keeping it from our taste buds! 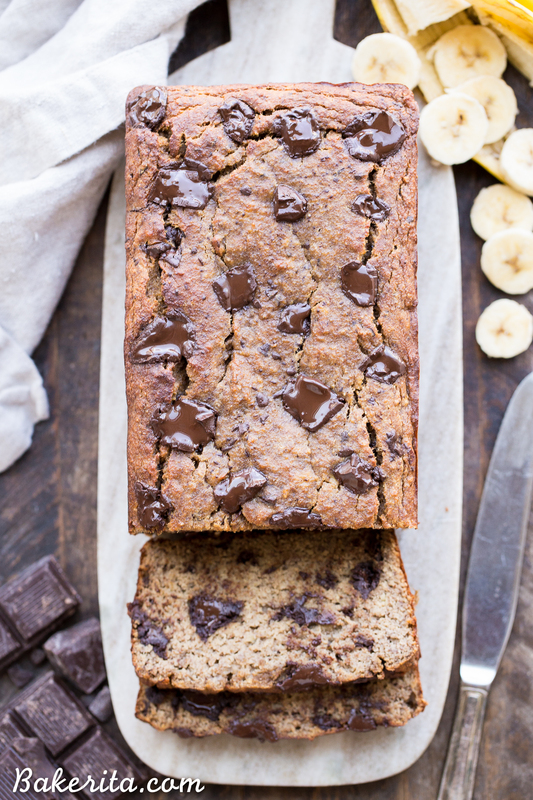 My hubanana loves banana bread (hence the name) and I Love chocolate…because I am a normal human. This is happening. Pinned! 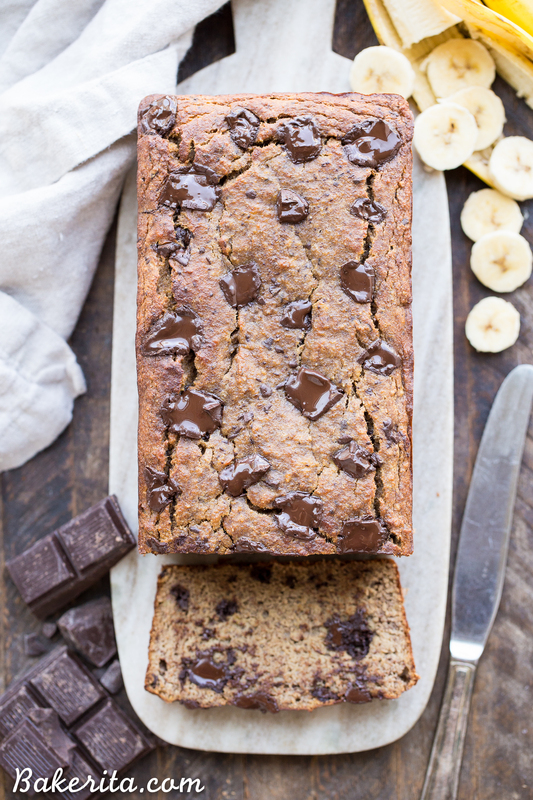 WOW this choc banana bread looks so delicious.. definitely could devour a slice right now. yum! You can never have too much banana bread!! Especially when it’s as healthy as this. One can never, ever, EVER have too many chocolate-studded no-other-sugar-added banana bread recipes, so I will happily read, make and eat as many more as you can throw at me!This looks fan-freakin-tastic. I just started baking with coconut flour and I am in LOVE! This banana bread looks absolutely amazing. And you used almond butter – YUM! This banana bread looks great and I’ve been grappling with the idea of doing the paleo diet, if treats like this are available, the diet is a cinch! Rachel! Everything about this sounds so amazing. . Banana and chocolate chips together is just yumm!! Gorgeous chunky banana bread! It looks so moist and filling inside. Wish I could grab a big slice through the screen! It looks so moooooooist! Ugh, I die!!! I love banana bread and am always up for a good paleo treat. I have a tub of coconut oil in my cupboard that’s begging to be made into all the banana breads. Bravo, my dear! I love that this is only sweetened with bananas (and chocolate chips) AND is grain free. Swoooooon! I’m so happy I stopped by your blog today. I have a plethora of bananas that need using and all the ingredients to make this bread-heading to the kitchen right now! This is the second recipe (first was a blueberry crumble, which I’ve made twice since it was so good!) I’ve made from your blog – loved this bread! Awesome – so so glad you liked both recipes!! :) They’re two of my favorites as well. This bread is divine. Makes one big loaf or two smaller ones. My kids love it, as do I and my husband! I tried this recipe yesterday. I know the greatness of this recipe is that it doesn’t have grains in it, but I didn’t have any coconut flour on hand so I used 1.5 cups of all purpose flour (I guess you need different quantities of different flours). The bread was delicious and it felt great knowing it was good for me too. Next time I will try with coconut flour. Good to know it works using AP flour as well! I have readers ask about that substitution for grain-free flours but because I’ve never tried it, I can never answer. Thanks for letting us all know it works in this recipe! So glad you liked the bread, Joelle! Do you know if almond flour can be used as a sub for coconut flour? I haven’t tried it, but coconut flour absorbs more liquid than almond flour does, so you might have to increase the amount. Joelle Mae, I would love to make this with all-purpose flour since I don’t have any coconut flour. However, I’ve read that coconut flour requires the use of more eggs. Did you adjust the number of eggs with the AP flour? I assume you could substitute vegetable oil for coconut oil in this recipe? Hi Em – though I haven’t tried with AP flour, I’d keep the same number of eggs the same. Since Joelle Mae didn’t mention changing the number of eggs, I’d assume she didn’t adjust those and just adjusted the flour amount to accommodate the amount of liquid. I hope this makes sense, and that the bread turns out wonderfully for you! Besides almond butter, Whay other types can I use? Thanks! I’ve only used almond butter, but you could use cashew butter, pecan butter, pretty much any type of nut butter you have available to you! Sunflower seed butter would probably work as well. Just came across this recipe on Pintrest…want to make it for my son, but he has allergies to almonds, can you use regular butter? If so, same amount? We could try sunflower seed butter as it is a seed and not a tree nut if regular butter does not work. Hi Cindy! I would definitely recommend a nut or seed butter, so sunflower seed butter would definitely be best if he can’t have nuts! You can use the same amount. Be aware that sometimes sunflower seed butter can turn a bit green in baked goods, so don’t be alarmed if that happens. I hope your son likes it! Not sure where you get 2 bananas that weigh over half a kilo! I would need up to 8 to get that weight of peeled bananas! Hi Anne, I know bananas vary widely in size, which is why I also provided volume and weight measurements so that the recipe will turn out most accurately for you. This is the second time I’ve made this recipe, because I have made several other paleo-friendly bread recipes and this is so far the best base. I did make a couple adjustments. I upped the cinnamon and added nutmeg and ginger and I added a ½ c of walnuts for crunch. I find it best for all these dense breads to beat the eggs to get them frothy and to sift the flour, no matter what kind and how fine. Getting it finer makes it the bread more airy. I recently found sweet potato flour and will try it next time, though I hate to mess with a good thing, but I think since I am getting to know this recipe, trying it once, will help me know what sweet potato brings to the table, so to speak. I didn’t start making breads and using dark chocolate till I was over a year on paleo as I was afraid they’d become gate-way drugs back to my old way of eating. In fact, I’ve learned that my palate no longer craves all the chocolate and the amount in the bread makes it satisfying that I don’t consider the old ways. Thanks for sharing this recipe! Thanks for the tips, Hunter! It’s good to hear how the recipe turned out for you and your recommendations. So glad you liked it! This is really great! I added one shredded zucchini b/c I needed to use one up and left out the chocolate b/c we’ve been eating enough of that lately. It’s really awesome even with those changes! Thanks for the great recipe! Awesome, I’m so glad you liked the recipe Chrissy! Thanks for letting everyone know how it turned out with the changes you made. I’m not a baker in fact baking and I don’t mix. I made this recipe and holy moly it’s good! I made muffins instead of bread baked for 20 minutes and they are perfect. I’ve scarfed down two already and I’m eyeing a third. 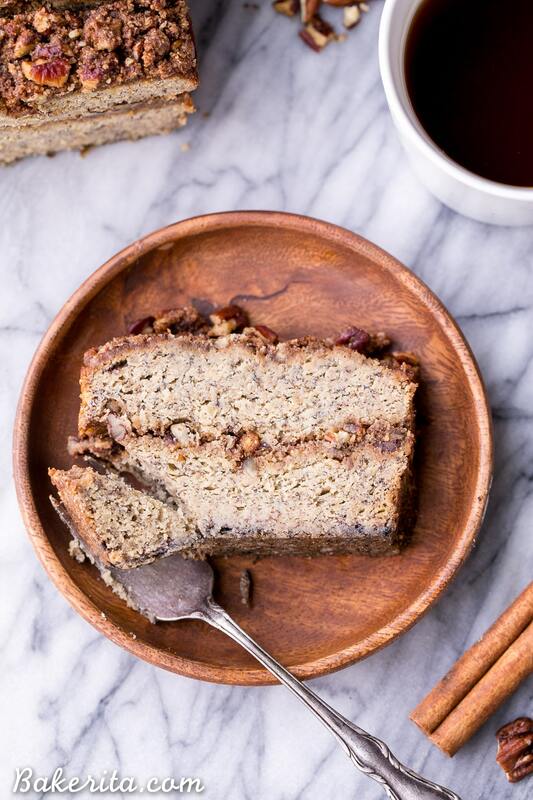 Thank you for sharing this…I’ve missed banana bread since going grain and sugar free. Quick question, where are you getting grain free baking powder? I’ve seen a couple of ‘paleo’ recipes with baking powder recently. The baking powder I have contains maize starch…. Hi Janice! If you’re concerned about grain free baking powder, you can make your own at home with just 3 ingredients to ensure it’s grain free. This recipe looks so good! I just started eating Paleo and I’m missing chocolate. I checked the link you provided for the recipe to make your own Paleo chocolate, but it states that it is not for baking. Have you (or anyone else out there) had success using this in baking? I really want to make this recipe! I’ve made this recipe several times!! It’s a massive hit in our household. Simple to make and by far the best banana bread recipe out there!! I made this on Sunday at about 11am by Sunday night it was almost gone I made it in a 9×11 pan and my hubs that HATES bananas was getting some every time he came in the kitchen as was I. It will be made for gathering ONLY I can’t be trusted with this in the house. I make this recipe at least once a month. I sometimes skip the chocolate or add just a little. I add chunks of pear or apple, with added cinnamon. Once I added caramelized ginger. This recipe is awesome. I’m fairly new to paleo baking. What do you grease your pans with? I’m guessing that shortening is out? Is it better to use almond butter, because it has a weaker flavour? Hi Anya. Yes, almond butter is recommended to use in this recipe, but other nut butters may be substituted based on personal preference. I absolutely looove this recipe. I have made it so many times now. And now that I have been struck down with the dreaded gestational diabetes it’s become a real life saver for when I crave sweets, which is most of the time! I just substitute five or six packets of splenda for the honey in the paleo chocolate chunks and it tastes just as good and doesn’t raise my blood sugar at all. That is amazing to hear – and thanks so much for sharing your chocolate trick for others who may be in a similar situation! So glad you love this recipe, it’s a favorite of mine too. Thanks, Lexi! I made this banana bread today and my kids loved it! I went to cut a slice to put in my daughter’s lunch and discovered that it had turned green! Not all the way through, but about half of the loaf is green. The only thing I changed was substituting seed butter for nut butter so I could send it to school. Has this happened to anyone else? Hi Vicky! So glad you liked the banana bread. Don’t worry about the green – that’s a reaction from using sunflower seed butter. Something in sunflower seed butter reacts with baking soda and baking powder and causes it to turn green as it cools. It’s totally safe though, just a little alarming when you’re not expecting it. Enjoy! I just made these with sunbutter and they’re delicious! My little ones and I each wolfed down our first slice and went back for seconds, thank you! So glad it was a hit! Thanks for sharing, Jessa! Wow! This bread was so yummy, and I didnt even notice a hint of coconuty flavor! I subbed peanut butter for almond butter and it worked perfectly. This is definitely a keeper, thank you! This bread is absolutely amazing!! Just made it now and I’m stuffed but keep picking at it because I am blown away at how tasty and decadent this is. I would easily take this over traditional banana bread any day! So happy I found your website… I have already made the Paleo chocolate chunk cookies and the raspberry crumble bars. Nobody I share these with can believe any of these desserts are Paleo :) I finally had to comment and thank you for bringing these extremely simple but delicious recipes online. You are very talented! Hi Jasmine – unfortunately, coconut flour is one of those ingredients that doesn’t substitute well because it’s unique in that absorbs a lot more moisture than other flours. This bread would need a lot more almond flour to hold together. I’d recommend grabbing a bag a coconut flour, it’s relatively inexpensive and since you typically need a little bit, it will last a while. Sorry, hope this helps! Yay, I’m so glad you loved it Jasmine!! Thanks for letting me know how it turned out for you :) hope you love any and all of the recipes you try! Hi Louise. Was it the bread that didn’t turn out, or the chocolate chunks? I’ve made this bread tons of times (as have readers) and haven’t had anything go wrong. If it was the chocolate chunks, could one of the ingredients have been off? That recipe is pretty straightforward and they should definitely not taste strange. Feel free to respond back or email me if you want some help figuring out what went wrong. This recipe is amazing!!! The first time around I did it in the loaf pan and while it tasted fine, the bottom was soggy while the top was burned. My oven cooks a bit hot, so this time around I’m using the 8×8 method. I also made my own chocolate chunks with your recipe and WOW!!! I can’t stop eating them! Better than a bag of M&M’s for sure! Cannot wait for this “loaf” to come out of the oven tonight! Yay, so glad to hear you like the chocolate chunks! I hope the 8×8 pan works better for you, and that you love the bread this time around. You could try cooking it on a lower temperature (maybe 25 degrees lower) to help it cook more evenly if it’s still a problem. Enjoy, Kristin! Hi Suzanne – I’ve created a specific recipe for a “double” chocolate version of this banana bread found here. If you’re using sweet, very ripe bananas, you shouldn’t have to add any extra sweetener! Hi, I’ve made this recipe 3 times now and it has never disappointed. Absolutely love the result each time. Thanks a lot for sharing ! I love, love, love the Paleo Banana Bread! My kids love it too. I have never posted a comment to a site like this, and I have never come back to a site to look for more recipes because I liked the first one so much. You have something very special going on here. The layout, the recipes,and the vibe that you magically seem to send out from the website are all terrific. I plan to try many of your creations. Thank you! Kellie, thank you so much for your comment! That makes me so happy to hear, and it’s comments like yours that inspire me to keep creating recipes :) I hope you enjoy each and every recipe you try! I have a question, can the coconut flour be replaced with almond flour? Hi Daniela – unfortunately, no. Coconut flour is way more absorbent than almond flour, so you would need a totally different amount of almond flour to get the same result, which would mess up the rest of the recipe. Thankfully…coconut flour is pretty cheap and will last you a long time. I’d recommend investing in a small bag for the recipe – it’s worth it! WOW!!! This turned out so delicious!!! I used sunflower butter instead of almond since i’m allergic to nuts and OMG it was amazingness. Thanks for sharing! Hi Rachael I just make this and I can’t believe it’s paleo! Really good:) I used peanut butter as I’m not paleo and just a regular vegetable oil. I just wanted to know how do you store the leftovers, fridge or room temp? It’s winter here in NZ so it’s pretty cold but I still want to make sure. Thanks so much for the recipe!!! Hi Rachael I just made this and I can’t believe it’s paleo! Really good:) I used peanut butter as I’m not paleo and just a regular vegetable oil. I just wanted to know how do you store the leftovers, fridge or room temp? It’s winter here in NZ so it’s pretty cold but I still want to make sure. Thanks so much for the recipe!!! Hi Alyssa! So happy to hear you enjoyed the recipe :) I like to store it in the fridge just because it’s so moist, it’ll help it last longer, although it would be good for a day or two at room temperature. It also freezes fabulously! Where the recipe states 4 tbsp of coconut oil, does this mean 4tbsp once melted? Or 4 tbsp out the jar when at room temperature then melt? I measure the melted coconut oil, since the volume can vary depending on the state of solid/liquid that it’s in. Hope this helps, Jen! Hi Miriam – I’d recommend finding another recipe if you want a non-Paleo recipe. This recipe was specifically formulated to be Paleo-friendly and to make it non-Paleo would require reworking the entire recipe. Sorry! Does anyone know how many calories in a slice?I’ve just made it and it looks and smells device, but should find out more so I don’t over indulge in one day! Just made these this weekend. 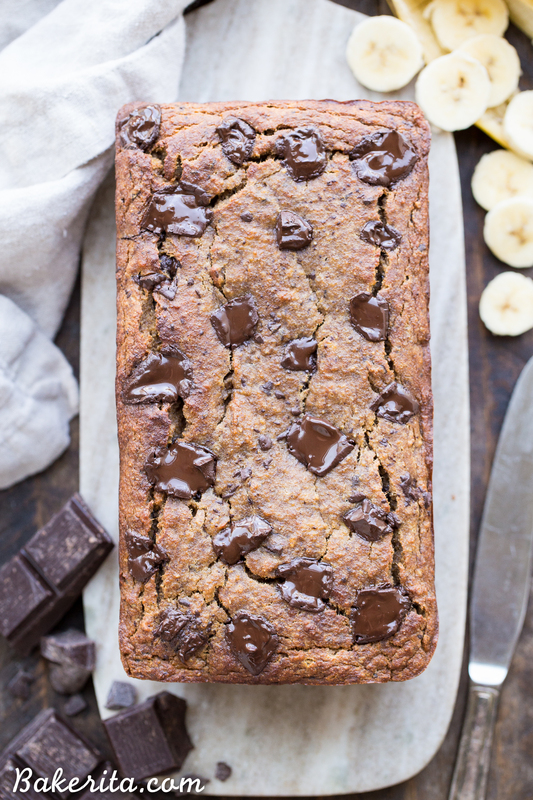 Paleo chocolate chunk banana bread. It was f* sensational. Would recommend and make again! Thanks Bakerita! So glad you enjoyed it, K! Thanks so much for your feedback. Awesome recipe!!! Came out delicious! I used enjoy life chocolate chunks. Should it be stored in the refrigerator? It can be kept at room temperature for a day or two, but I usually store it in the fridge to help it keep longer! These were delicious and so easy to make. I used dark chocolate chips since that is what I had. Just love that there is no sugar or sweeteners of any kind. The first time I made it in the loaf pan, the second time I tried it as muffins. I used the silicone muffin bakeware and they popped out easily. I sprayed the bakeware and cooked them for less time 25 minutes. Yummy, thanks for the recipe. So happy to hear you enjoyed this recipe, Susan! Thanks for your feedback. Yes it freezes very well, just make sure it’s well wrapped to prevent freezer burn! I was making notes on what ingredients to buy to bake the banana bread when a question popped up. You recipe says “1/2 cup (140 grams) almond butter” and “1/2 cup (75 grams) coconut flour”. Is it true that half a cup converts to 140 grams when it comes to butter, but only to 75 grams when it comes to flour? Thanks a lot in advance! Hi Franzi, yes it’s true! Different products weigh different amounts based on volume. Hi Jen – how odd! Depending on your oven, your temperature could’ve just been off which caused the bread to cook slower. It’s important to always cook bread like this until its no longer jiggly and it springs back when poked. It probably fell apart from not being cooked enough. Sorry you had trouble! I will be baking it in a shallower pan next time. My oven is wretched and runs too hot but i have it in the oven ( again) on a cookie sheet to get it firmed up. It tastes amazing though. I will be trying again. Hi! I made this today and while it came out delicious, it seems more like a soufflé than a bread. Very moist. Did it not cook long enough? I did 60 minutes at 350 and THOUGHT the toothpick came out clean. This is my first go-round with paleo baking, so I want to be sure I did it right! My 2 year old loves it and I also want to make sure it’s cooked enough. Thanks for any help you can give! Hi Carole, paleo baking can be tricky and sometimes based on your bananas, it might need a little bit longer. A good trick is to press down lightly on the bread – if it springs back, it’s ready to go, but if the finger imprint stays, it needs a little long. You should be fine with it being cooked through enough for your 2-year old, though! haha JUST posted my own comment about this same feeling, and then I saw your comment! Mine came out the same… I’m pregnant and so also wanting to make sure it’d be safe for me to eat! Hi Justine, so sorry you had trouble! It shouldn’t be too soft, but after an hour in the oven, it will be fine to eat as it’s been heated enough for any bacteria to be killed. I just added a note to the recipe to test the doneness better – when you press against the top of the loaf, it should spring back, not stay indented. Hope this helps, and again, so sorry for your troubles. You could probably toast each slice individually to make it a better texture for eating! can i use all almond flour in place of coconut? if so, how much? I haven’t tested it this way so no guarantees, but you’ll want to use 3x the amount of almond flour since coconut flour is so absorbent. Enjoy! The. Best. Banana. Bread. Ever. End of story! Thank you so much for sharing, lovely! So glad you’re loving it!! Thanks for sharing your feedback, Marisa. I LOVE your pumpkin granola recipe – make it ALL the time for years now… (I do add more pumpkin as I like it all to stick together) so THANK you for that recipe. Looks like it worked for others so must be me!!! I did flax egg instead of regular egg just because I didn’t have any at the time. THANKS for trying unique recipes. and THANKS for your pumpkin granola – THE BEST. Hi Laura, yeah, unfortunately it’s definitely the flax egg – it doesn’t work at all with this recipe. I’d recommend my gluten-free vegan banana bread instead, which was formulated to be vegan! :) So glad you enjoy the pumpkin granola. This is so good, why make any other recipe? Love it so much, so satisfying! Great in my kids’ school lunches, too. Thanks a bunch! What a compliment! So glad you and your family enjoy the banana bread! Hi! What is the best way you have found to store your bread? I keep it in the fridge or I slice it and put it in the freezer. Fantastic recipe! I added 1/2c of dates for added sweetness and it turned out great. Thank you! So thrilled you’re enjoying it, Leah! Thanks for the feedback. Oh my goodness!! Melts in your mouth delicious. Made it with the Paleo chocolate chunks. So quick and easy, I will make this again! I’m so thrilled you enjoyed it! Thanks for the feedback, Terri.